Our God really does care about the little things. And our God really does use the little things to break the ice. After weeks of praying and searching God’s heart, we decided it was time to buy a new car. Our old car was started to be a bit dodgy and we had a feeling that sooner or later it would cost us a LOT of money to fix. So we wanted to trade it in before that happened! We went out one weekend to look at cars and came back having made a decision that we wanted to test drive and buy a new(ish!) Vauxhall Vafira. You know, one of those big boxy family type cars with extra seats in the back in case you accidentally have two more children than planned…. The next weekend we booked in three test drives of three similar cars and prayed for the best (I really wasn’t looking forward to a whole saturday being wiped out spending it in cars and car showrooms). So off we all drove to the first car showroom excited to start the day and find a new car. It was all going well until Rob went off to get the car seats out of our old car so we could put them in the one we wanted to test drive. 10 minutes later he still hadn’t returned – that couldn’t be good…. When we all went out to check (me, sam, reuben in his car seat and the sales lady), Rob was wrestling with Sam’s car seat – it was stuck. Our old car had this annoying feature that if you stopped pulling it out, it had to go all the way back in again to come out again. And when undoing the seatbelt, it had gone in too far and got wrapped around the arm of the car seat. 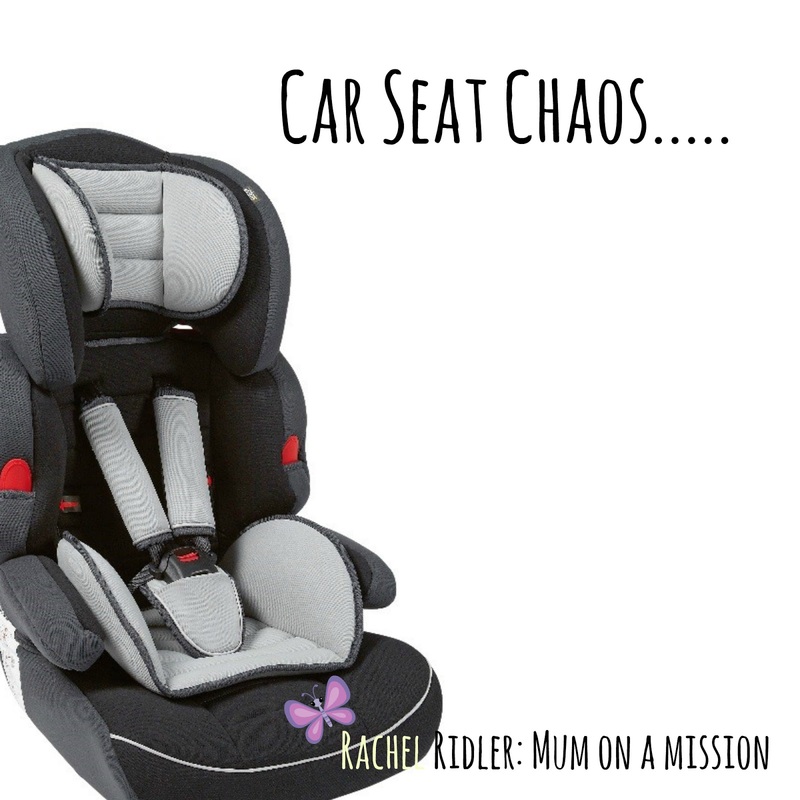 There were only two options here – cut the seat belt of the car we were hoping to sell with the sales lady stood right in front of us, or destroy the car seat in some way. We went for the second option, and Rob sawed off the arm of the car seat with his pen knife. It made for an interesting ice breaker with the car sales lady, who we entertained around Chesterfield on our test drive. When we got back to the showroom we got such a deal from her that we couldn’t refuse, and we bought the car there and then. It was lovely though to be able to spend time talking to her and getting to know about her. She obviously felt valued in speaking to us, as she then sent extra goodies for Sam when Rob picked up the car, a handwritten thank you card for buying the car from her and then a parcel of goodies for Sam’s birthday also turned up in the post a week later! It all seemed to turn out ok (and we had managed to time our test drive perfectly to fit in with their company’s promotion of offering a free night away in a hotel when you test drive a used car! ), but my heart was heavy that my son was sitting in a car seat that could possibly be dangerous. I mean, it was still strapped in with the seat belt but having a sawed off arm couldn’t be great, could it?! I hadn’t prayed about, but God knew it was weighing heavy on my heart. Then a couple of days later I got an email from Argos. The car seat was being recalled due to faulty plastic used in it. We could have a complete refund of £50, no questions asked, it we took it back! I sometimes stand in awe and wonder at how amazing our Father God is and in his timing. We bought that car seat over 9 months ago and yet the timing in the recall fitted perfectly with when we truly needed it. So many positive things came out of this experience for me – getting to speak light and truth to the lady at the garage, getting a new car seat for free (when it all seemed to have gone wrong), getting a free night away in a hotel and finally my son being blessed with presents as well. God uses every little experience in our life for His glory and that really and truly excites me. I hope it excites you too. Happy for you that things fell into place the way they did. Getting a new car seat for free is a real special thing. My husband and I recently also had a great experience with a car dealership. They really went out of their way to make us feel special.